If you don’t want to fall off your new healthy eating regime you have to be prepared to fight temptation while grocery shopping. It is easy to lose focus and start perusing the aisles aimlessly. Before you know it, you get home and while you’re putting your food away realize you bought junk food that you shouldn’t have or spent much more money than you had budgeted. Before your next visit to the market, consider these 5 tips to make your shopping experience more productive. Planning out meals every week or even for the whole month may seem tedious at first but it goes a long way in both saving money and ensuring you eat what you are supposed to. Before you head to the grocery store, sit down and think about what you want to eat. If you have no idea what you want it can be helpful to look through your local store’s weekly flyer to see what’s on sale and work around that. Once you figure out an idea of what meals you want to eat you can look up recipes so you can put together a shopping list. This will help you ensure you only buy the ingredients you need. This whole process of finding meals and going through recipes is easily streamlined by using an app. Two excellent apps to use are Yummly and Fooducate. As an added bonus with Yummly is that you can “Yum” your favorite recipes and add the ingredients in them automatically to an in-app shopping list. Having a detailed shopping list will help you shop more efficiently by finding what you need more quickly. This is especially helpful in a very large supermarket. When you are writing a grocery list based on a sales paper, meal plan or recipe it is important to write down brand names or know what generic brands you can buy for member prices. You may also want to write down sale’s prices so you are sure you are buying the right product. Also, don’t forget to check for coupons online before your trip to the store. Listing the ingredients you want to purchase by location in store can also be done and prevents you from having to go back and forth from aisles to, say, the produce section. Some stores provide the aisle info online. Time Yourself: Set the timer on your phone for 15-20 minutes (however long is a reasonable time for your list) and get your shopping done in that time. You could also set the stopwatch and simply work against yourself to see how quickly you can get everything. This could be really fun for shopping with your children if they are old enough to go through the store to grab items by themselves. Use Exact Cash: This can be really helpful if you tend to buy junk food at the last minute and also use sale’s flyers for shopping. Write down prices for all the ingredients, add it up including tax, and only take in just enough cash to cover the cost of your list. Not having extra money or your debit card will stop you from buying something you shouldn’t. 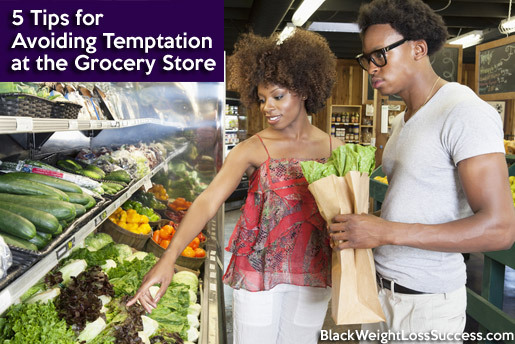 Going grocery shopping while you’re hungry is a very bad idea, especially when strong cravings are in play. When you feel hungry and you’re surrounded by tasty food you are much more apt to: 1) buy more than you need in terms of amount and calories, and 2) buy foods that aren’t on your list (junk food, highly processed food). The idea of not grocery shopping while you’re hungry isn’t just good judgement but also scientifically sound. A study in JAMA Internal Medicine archives done in 2013 showed that participants who fasted prior to shopping didn’t necessarily buy more food but they did buy more high-calorie food. Even more interesting is that being hungry while shopping doesn’t just affect the types of groceries you buy but also non-food items as well. Researchers at USC Dornsife found that participants who were experiencing hunger pains while shopping would purchase more non-food items than those who had eaten recently. Similarly to shopping hungry, don’t go shopping when you feel any exaggerated emotion. This could be upsetting emotions like anger or just excitement over getting together with your girlfriends on the weekend. If you are an emotional eater, going shopping while you feel any strong emotions can lead to unwise food choices. Food is very connected to comfort and celebration in our society. While many studies about emotion and impulsive shopping, like this one, don’t involve grocery shopping, researchers agree that the result is very much the same. When you combine the effects of emotion with hunger, it’s pretty much a guarantee you’re going to buy more than you should or overindulge in your favorite comfort foods. Go grocery shopping when you are in good, neutral mood and dealing with limited stress. Reducing your stress might mean leaving the kids or your significant other at home. It may also mean going shopping very early in the morning or at night when the store isn’t so busy. Whether you are shopping without a list or with a full, detailed list, it is best to stick to the perimeter of your store as much as you can. Why? Majority of grocery stores tend to keep produce, meat, frozen produce, and other whole foods on the outskirts of the store while most of the processed foods that can stay on the shelf for months are in aisles in the middle. By staying on the outside of the aisles as much as possible you are going to keep your mind on track. Many of these tips for staying on track are basic but very powerful. They will also become second nature as you practice them. Be sure to put some or all of these tips into effect the next time you need to restock your fridge and pantry. When we fail to plan, we plan to fail. Are Sad Movies Are Making You Gain Weight?